Viral respiratory illnesses include colds, flu, and RSV. Treatment will focus on relieving your child’s symptoms and ensuring that the infection does not get worse. Antibiotics are not effective against viruses. Always consult with a doctor if your child has trouble breathing. Keep your infant’s nose clear, using a rubber bulb suction device to remove mucus. Run a cool-mist humidifier or vaporizer in your child’s room to keep the air moist and nasal passages clear. Do not allow anyone to smoke near the child. Treat your child’s fever with children’s acetaminophen or ibuprofen (such as Tylenol or Advil). Do not give your child aspirin. Has a temperature over 102°F. Has nausea or vomiting; can’t keep even small amounts of liquid down. Hasn’t urinated for 6 hours or more, or has dark or strong smelling urine. Has a harsh or persistent cough or wheezing; has trouble breathing. Has bad or increasing pain. Is very tired or lethargic. Much “achoo” about nothing! 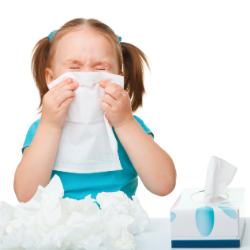 What should you do if your child has the flu?